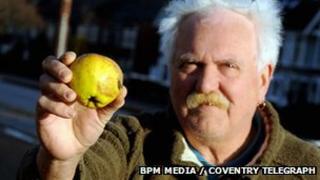 Residents of Coventry have been left mystified after hundreds of apples fell from the sky over their homes. People in the Keresley area of the city said the fruit came raining down at about 19:00 GMT on Monday, hitting passing vehicles. Parish councillor Sandra Camwell said the apple storm lasted a few minutes and was the second occurrence of its kind in a fortnight. Weather experts said winds could have carried the apples from an orchard. Ms Camwell said there had been no reported injuries and only minor damage to a handful of cars. Dave Meakins, 63, who lives near the junction of Kelmscote Road and Keresley Road, said he had found dozens of apples in his garden. Many more were scattered across the road and found in gutters. "At first I thought it was kids, but there were too many apples and they were crushed as if they'd fallen from a great height," he said. Mr Meakins said some of the apples were large, like cooking apples. Prof Robert Kerr, an expert in atmospheric modelling at the University of Warwick, said it was possible the apples were lifted from a nearby orchard by the wind and released over the junction. And Charles Powell, forecaster for the Met Office, said it was "not impossible" that strong winds lifted the apples and carried them over Keresley. "It's not the first instance I've heard of this happening," he said. He added: "It was a fairly moderate westerly wind (in Coventry) much of the day but during the afternoon there was a weather front approaching and it looks as if the wind increased for a time. "It looks as if it was fairly strong wind as that band of cloud and rain went through. "The wind increased rapidly. When a cold front goes through in many instances wind can increase rapidly and you see localised events with fairly large gusts and rapid changes in wind direction." Allen Hogan, the owner of Hogan's Cider in Alcester, 30 miles away, said there were no apples obviously missing from his orchards. In Keresley itself Ms Camwell said there was only a small number of fruit trees. She said she believed the apples could have fallen from a passing aircraft. Could it actually rain apples?